Thanh An is formally called "a tourist destination near Saigon", or simply called with only a short word "island commune". The reason for this is that Thanh An is not a tourist destination, but for those who love traveling, backpacking, this is also an interesting place. You love the sea and like to eat seafood, you want to get away from the hustle and bustle of Saigon and want to find a place of peace, but you no time to go to a distant destination. Can a place very close to Saigon where you can travel to and get back within the day, a place where you are free to play and discover or just a place to welcome the sea breeze meet your demand? Thanh An is a small island commune in Can Gio District. Thanh An Island has an area of about 131 square kilometers with about 5,000 inhabitants and was considered as the key gateway of Saigon - Gia Dinh between two big rivers: Thi Vai River and Long Tau River in the past. To reach Thanh An, from the center of Ho Chi Minh City, you have to reach Can Gio. From Can Thanh wharf of Can Gio district, you take a 45-minute boat to Thanh An island commune, residence of about 5,000 people. - Travelling by motorbike: You ride along Huynh Tan Phat street - passing Binh Khanh ferry (the ticket is 3,000 VND/ motorbike) then go straight to Can Thanh market to get to the pier. In the dock area, you can ask local people to leave your vehicles there. - Travelling by bus: From Ben Thanh, you catch the bus number 20, get off at the last station, Binh Khanh ferry, the ticket to go through the ferry is 1,000 per person / time. after that, you catch the bus number 90 (this is the only bus to Can Gio), remember to ask the driver to stop at the ferry. - Boats from the mainland to the island depart at 6:30am, 9:00am, 10:30am, 12:00, 2:00pm, 5:00pm. - Boats from the island to the mainland depart at: 6:30am, 9:00am, 10:30am, 12:00, 2:00pm, 5:00pm. The fare is VND 10,000/ ticket. However, the departure times may vary depending on weather conditions and the tide. If you want to travel to Thanh An, you can come here at any time of the year, because the weather is very convenient. However, you should avoid going on rainy days, because the boats to the island are traditional wooden ship and are not suitable to go on rainy days. 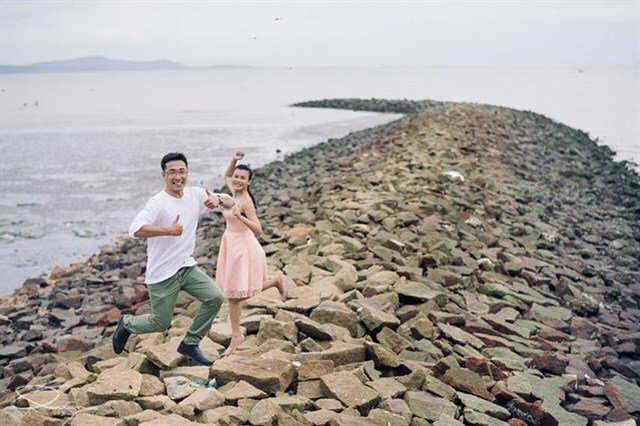 Thanh An Island is not a famous tourist destination, there are no beautiful scenery to make visitors astonished but in return, this small pristine Thanh An island brings peace, simplicity, a life of the people in the fishing village around the year with a smile on the lips. Coming to Thanh An, we will feel the peaceful, airy space which is far different from the bustling of Saigon. Just imagine that in one evening, you and your lover hold hands together walking on the long dyke around the island, watching the sea together and listening to the waves slapping the shore, you will feel a really peaceful and poetic sensation. If you travel to Thanh An in groups, you can go along the shore to catch snails. This is also an interesting experience for those who want to leave the urban, and seek for peace, wildlife. Thanh An Commune in Can Gio District is the only island and the most difficult island commune in Ho Chi Minh City. Due to the geographic distance, the life here is extremely difficult. Thanh An is considered the key gateway of Saigon - Gia Dinh in the past. The commune has nearly 1,200 households, divided into 3 hamlets: Thanh Hoa, Thanh Binh and Thieng Lieng. 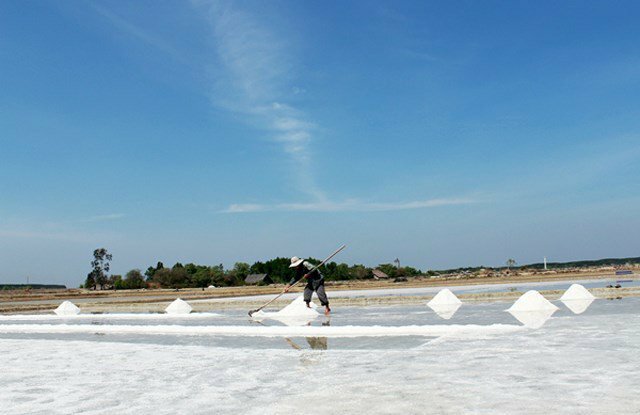 The population of Thanh An Island is about 5,000 people who mainly live in feeding and catching sea creatures and making salt. The main task of the women in this island commune is to knit the net, we can encounter women making net everywhere and the men are absent due to the focus on catching clams, scallops and fishing. For seafood enthusiasts, they have heard the fame of Can Gio seafood, which is delicious, fresh and cheap. In Thanh An, you can buy seafood with those features but at a lower price. Cà Na (proper name) snail is sold with the price of 80,000 VND/ kg. If you want to be more sophisticated with Cana snails stirred with curry or with cheese, you should prepare ingredients brought from the mainland, then buy fresh snails in the market and ask local people to cook for you. You can taste this snail in the stall with 16,000 VND/ dish. Clams on the island of Thanh An are quite delicious, when you eat, you can feel bold sweetness. Steamed clams served with chili and garlic sauce is a simple dish but can not be ignored when you visit the island. The price of fresh clam is 15,000 – 20,000 VND / kg. If you go to the market on the island early, you can very big Mantis shrimp, only 2-3 shrimps/ 1kg. After 9am, the market gradually dissolves, some houses sell shrimps that are in medium size for tourists, there are services of steamed seafood with lemongrass or cooked seafood hotpot if you want. Prices ranged from VND 80,000 to VND 150,000/ kg. Recently, a few households on the island has served grilled and seafood hotpot for tourists, the most common dishes are octopus, squid and shrimp. With only 30,000 – 50,000 VND, you can eat grilled seafood. The snack food is also very various and cheap: chicken legs, grilled skewer, baked rolls, baked fish, grilled dried fish. grilled banana... for only 2,000 – 5,000 VND. On the island, there is noodle shop which formerly served only breakfast served to the islanders, but now opens until 4 pm to serve tourists. The noodle soup has sweet broth including peeled shrimp, the price is 15,000 VND/ bowl. In addition, the dish which can be considered as the specialty in Thanh An is grilled bread filled with dried shrimp roasted with grease onion, spicy sauce. This is a snack sold from noon to noon, the price is 3,000 – 5,000 VND / dish. - Thanh An is not tourist island, so there is no hotels or guest houses on the island. If you want to spend the night, you can buy fresh food and then visit the house of local people and ask them to cook the dishes, and also ask them to let you stay in there house. Do not worry because the people here are very moderate and hospitable, they are not as precautious as the people in the city center. In addition, some motorbike taxi drivers know the need to find a place to stay in the island of tourists, so they have homestay services. These people will often ask you about the need to find housing and introduce their home, the price is also very affordable, but you should also ask carefully before deciding. - The food stalls on the island are also quite available with milk tea, plan cakes, skewers …. However, at noon, there are few restaurants serving, so you should prepare food to bring in the island if you can not find a place to eat. - Despite not being as famous for delicious food as in Binh Ba or beautiful scenic beauty as Nam Du, Thanh An brings the beauty of a private peaceful island commune. 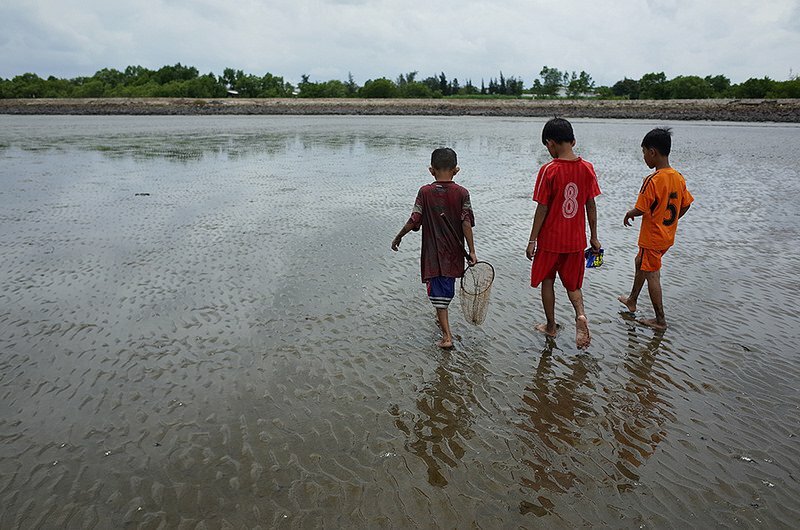 More than 70 km from the city center and taking visitors 45 minutes traveling by boat to reach, Thanh An is an isolated place with the mainland. Enjoying a weekend in Thanh An will bring you the atmosphere which is completely different from your daily life. This place is suitable for those who want to find a quiet, clean atmosphere and to get away from the smoke and noise of the city.